With the English seemingly set to come on board, all looks rosy for the ERC but this battle will resume next year. 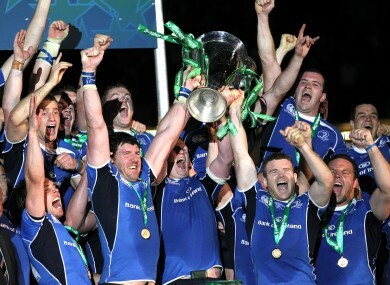 Leinster celebrate their 2011 victory. IT’S VERY DIFFICULT to feel sorry for the English clubs in this entire European rugby mess, but they have been well and truly stabbed in the back by the French. Of that there is no doubt. The PRL’s aggressive and uncompromising stance throughout was built on the foundation of strength they had due to the Top 14 clubs’ support. Premiership Rugby chief executive Mark McCafferty won absolutely no fans outside England with his unwillingness to negotiate, but he was looking out for what he feels is in the Premiership clubs’ interests. The staggering turn-around looks like it may be complete in the coming days, with McCafferty apparently back tracking on what he has insisted upon all along. We can only guess how angry and betrayed he feels at the LNR [Ligue National de Rugby]. “If somebody can outline what that transition would entail, how the issues would be overcome and exactly what the new structure in 2015-16 would be, then we could look at it,” McCafferty told PA.
Those sound remarkably like the words of a man who didn’t see this maneuver coming from the French; someone who has been totally blindsided and suddenly finds themselves on their back. The PRL’s position is one of utter weakness now, and returning to an ERC-run competition with their tail between their legs looks like the only option. So why the u-turn from the LNR? This is the organisation whose president, Paul Goze, said, “The ERC is finished,” mere weeks ago. Well, if truth is told, they have had the heat put on them by the FFR [the French equivalent of the IRFU] and also had the deal sweetened with a reported €2 million pay-off for each club. John Hayes, Jerry Flannery and Marcus Horan with the 2008 Heineken Cup. ©INPHO/Billy Stickland. It’s worth pointing out that the French clubs’ statement last night, through the LNR, stressed that they will be attempting to push for a new European governance model from the 2015/16 season. Goze has highlighted that playing under the ERC’s rulings will only be for this “transition season”. The season after next, Goze insists, will see the demise of the ERC and the creation of a new governance model for European club rugby competitions. That model will give full control over commercial marketing and television rights to the clubs themselves, according to the LNR. Goze, never one to accept that he has taken a backwards step, says the LNR’s threats to join the Rugby Champions Cup were simply a way of getting what they wanted. It was not an end in itself,” he told L’Équipe. “It was a way of obtaining progress on the format, financial distribution and governance. We have got two out of three of those points. We have recoiled, maybe, but only because we are intelligent. Goze went on to stress that the LNR intended to ensure the English clubs would play in the ERC-run Heineken Cup next season, once again highlighting the power of the Top 14 clubs. Throughout this entire debacle, they have been the ones with the truly deciding vote, simply because they are the richest clubs in Europe. The Heineken Cup lives on for next season, but thereafter there are certainly big changes on the horizon. Goze has alluded to how clubs are the real driving forces in European football, and that is where rugby is going, whether we like it or not. Another year before that land shift starts at least allows the IRFU to ready themselves for a situation that may seem like Groundhog Day. Email “The Heineken Cup lives on... for now”. Feedback on “The Heineken Cup lives on... for now”.